!!WARNING!! This is a demanding cross-country route. No trail exist. Extreme caution must be taken during this hike. It should only be attempted by experienced backcountry hikers. Hazards along this route include jagged volcanic spine ridges, very loose rubble rock, narrow shelf bypasses and tall sheer cliffs. This ridgeline hike is located within the Big Horn Mountains Wilderness and is managed by the BLM (Phoenix Field Office). The wilderness was established in 1990 and encompasses 21,000 acres. This unique wilderness is rarely visited, offering excellent solitude. The entire hike stays within the wilderness. Vegetation consists of saguaro cactus, cholla, apache hedgehog cactus, ocotillo, mesquite, ironwood, paloverde, and creosote. Fauna in the area consists of bighorn sheep, golden eagles, kit foxes, desert tortoises, Gila monsters, wild burros, and mule deer. The Big Horn Mountains were formed as the result of a volcanic upheaval during the early Tertiary Period as well as many other prominent mountain ranges in the area. Within the Big Horn Mountains is Big Horn Peak, which is the central volcanic neck or plug for the west central portion of Arizona. The aggressive upheaval of this volcanic mountain range contributes to the rugged nature of this hike. This cross-country hike is a lasso loop and starts out across a gentle open desert with numerous arroyos before actually ascending the first segment of the ridgeline ("Mark 007", Lat. 33 Degrees/35'/29.50"/N & Long. 113 degrees/5'/42.00"/W). The ridgeline becomes very prominent and easy to follow from here. Along the ridgeline you will encounter more obstacles and problem areas than I could ever begin to describe but your efforts will be rewarded. The amazing views, intricate rock formations, and cave like outcroppings along the way will help you forget the pain. Loose rubble rock is everywhere and the solid sections are jagged and sharp. It's imperative that you take your time and pick your lines carefully. This is not a hike that you want to be in a hurry to complete. The route you choose will really depend on skill level and climbing ability. At about 3/4 mile along the ridge you will encounter a rugged solid rock technical climbing segment. The bypass for this segment is a loose rocky side hill that demands respect, however is manageable ("Mark 019 Bypass", Lat. 33 degrees/35'/57.45"/N & Long. 113 degrees/6'/44.56"/W). Shortly after this bypass, along the crest of the ridgeline, you will encounter an amazing 335' solid rock tower. The bypass for this segment is refreshingly easy when compared to the last one ("Mark 022 Bypass", Lat. 33 degrees/36'/03.87"/N & Long. 113 degrees/6'/59.56"/W). At about 1/4 mile from the tower you will encounter another rugged solid rock technical climbing segment. The bypass for this segment starts out with a loose rubble climb towards a small notch saddle. Climbing up to the notch will reward you with a rather shocking view down the other side. Just below the notch you will be walking along a rugged game trail that follows the base of a cliff ("Mark 026 Bypass" Lat. 33 degrees/36'/19.24"/N & Long. 113 degrees/7'/12.02"/W). Follow this narrow path around the base of the cliff, and then back up to a saddle on the ridge. The remaining 1/4 mile segment is pretty much stress free, however don't get too relaxed because the cliffs along the west side of the ridge just below you are death drops. The end of the hike will be very obvious because you will come out onto a point with steep cliffs on both sides and a short cliff just below a jagged rock spine on the ridge itself ("Mark 032" Lat. 33 degrees/36'/33.36"/N & Long. 113 degrees/7'/21.96"/W). Along the final 1/4 mile segment you will be rewarded with great views of the very prominent "Big Horn Peak" to the northwest. For the return route you will need to backtrack to the last bypass and follow a small yet manageable ridgeline down off of the mountain ("Mark 033 Return Route" Lat. 33 degrees/36'/20.56"/N & Long. 113 degrees/7'/11.39"/W). Just down from the top you will come out onto a flat point with a short cliff on all sides. 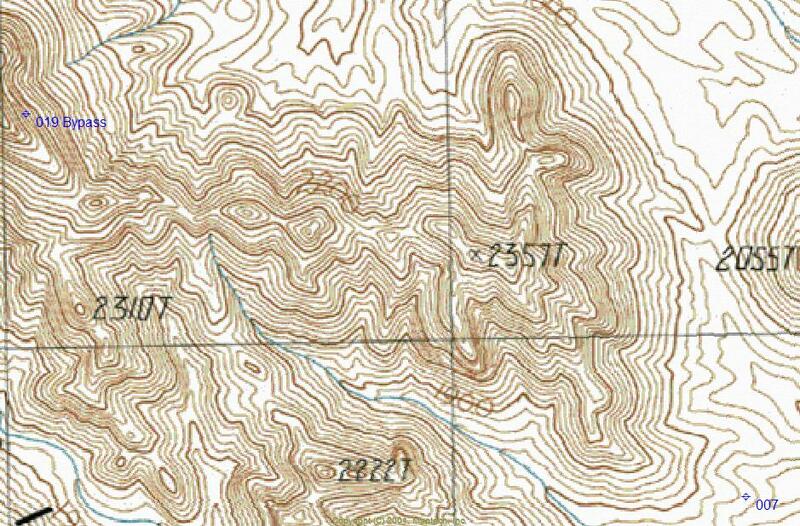 From this location you will need to head south, down a steep and loose drainage ("Mark 038" Lat. 33 degrees/36'/21.54"/N & Long. 113 degrees/7'/03.53"/W) that intersects a larger drainage heading down to a "game water" structure that was built by the Arizona Game & Fish Department to support wildlife in the area. After reaching the "game water", the remaining segments of the hike are easy and pleasant. 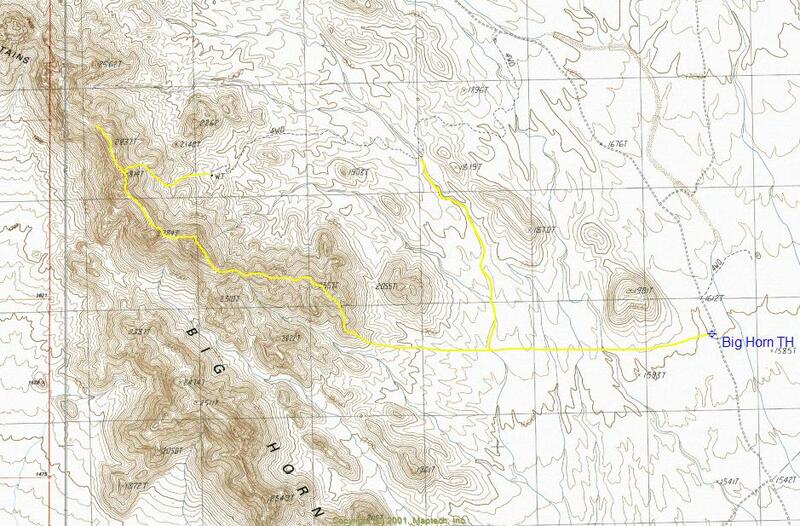 From the "game water" you will follow a closed jeep route heading primarily east to a large sand wash ("Mark 048" Lat. 33 degrees/36'/24.25"/N & Long. 113 degrees/5'/29.15"/W). You will now follow this sand wash down to where it intersects the route that you used at the beginning of the hike to reach the ridgeline (Approximately Lat. 33 degrees/35'/30.14"/N & Long. 113 degrees/5'/05.23"/W). The sand wash you will be following is refreshing and lush with some interesting sections. From the intersect point, head directly east back to the trailhead. 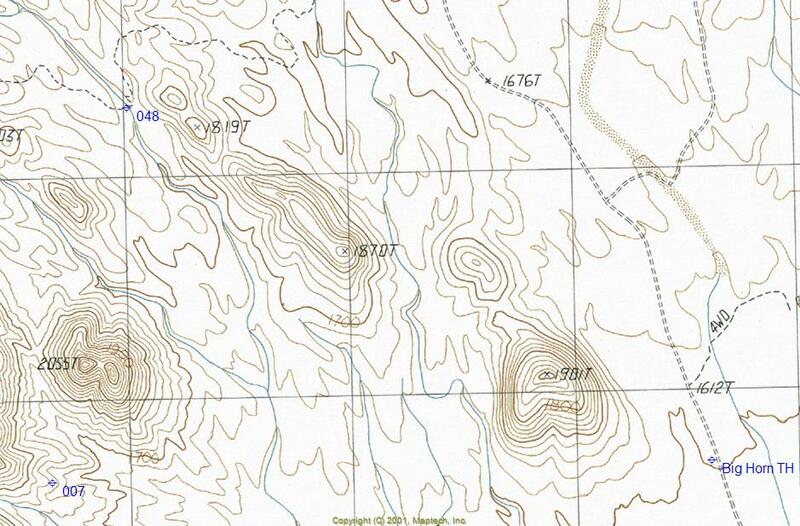 See maps for locations of GPS waypoints described in the text. Hiking the Big Horn Mtns Ridgeline can only be described as epic. This is a wicked ridgeline hike with amazing views and vistas along the route. If you're looking for something different with challenging terrain, this hike will not disappoint. With an early start, you will have the sun at your back along the entire ridgeline offering great photography. This hiking route is less than five miles from the I10 freeway, yet it may as well be in the middle of nowhere. The freeway is not even visible until about half way along the ridge due to being obstructed by a taller secondary mountain just southwest of the hike. The rarely visited Big Horn Mountains Wilderness seems like the land that time forgot. It's deathly quiet and the only evidence of human contact being the road that accesses the wilderness. This is a unique and special area. Count on having it all to yourself if you go. From Phoenix take I10 west beyond the city of Buckeye to Exit 94 (Tonopah). Go south from I10 and turn west on Indian School Road, which is just beyond a gas station. The first part of Indian School is paved, yet eventually turns to gravel. 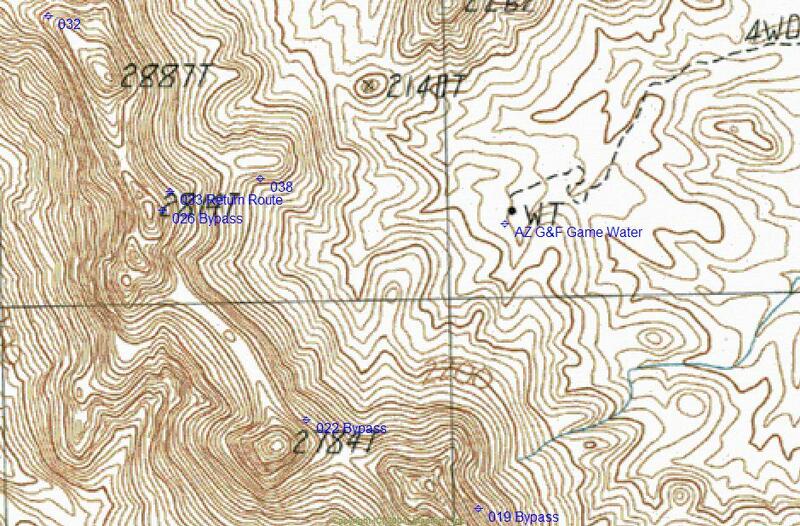 Drive west on Indian School Road 5.0 miles to an unmarked ( desert-boonie writes: FT3W and just after mile marker 2 ) non-maintained road that is suitable for high clearance two-wheel drive vehicles. Before arriving at this turn, Indian School bends northwest to go around a small mountain. Once on this unmarked road you will drive 1.1 miles to the northwest and drive under the freeway through a narrow one-lane underpass. Immediately beyond the eastbound underpass you will turn left at a fork. Drive 0.2 miles paralleling the freeway and turn right. Almost immediately beyond this turn you will turn left. You are now on the road that accesses the wilderness. After approximately 2.7 miles you will reach the Central Arizona Project canal. Along this 2.7 mile section there will be a couple of right turns that you will want to avoid. Just beyond the canal you will go through a wire gate. From the wire gate you will be driving northwest approximately 4.0 miles to the trailhead. Use care to stay on the main route. There are a few side turns along the last four miles to throw you off.